Elmer C. Snoap, aged 89, of Wyoming, went to be with his Lord on Sunday, September 9, 2018. Elmer's faith was first and foremost in his life. He continued witnessing to others to the end. He was preceded in death by his parents, Alexander and Mae Snoap; two brothers and six sisters. Surviving are his wife of 70 years, Lois; children, Marty (Julie Courtney) Snoap, Dana (Nancy) Snoap, Linda Hawkins, Cherie (Ray) Snoap-Andrakowicz, Leslie Snoap; 14 grandchildren; 17 great grandchildren; sister and brothers, Diane Corcoran, David (Char) Snoap, Bruce (Chick) Snoap; sisters-in-law, Shirley Snoap, Norma Hoek; brother-in-law, Roger (Angela Chavez) Hoek; several nieces and nephews; special friends, Ann and Clyde LaBrenz, Ed Dantuma. Elmer appreciated all manner of sport, especially the Godwin and Michigan Wolverines! He was inducted into the Michigan Amateur Softball Association Hall of Fame in 1993. 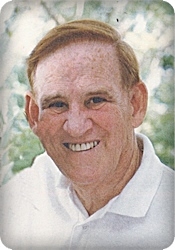 He served 57 years umpiring softball and baseball at both local and national levels. As a founder of Holwerda Snoap Sporting Goods, Elmer developed numerous valued relationships within the community. In addition, Elmer loved his travels and camaraderie with "the brothers" including many ventures to Disney World. The family will greet visitors on Tuesday, September 11, from 6 - 8 pm at Stroo Funeral Home, and Wednesday, September 12, from 10 - 11 am at Good News Baptist Church, 6830 Eastern Ave. SE, where the funeral service will begin at 11 am, with Rev. Brian Cederquist officiating. Interment in Rosedale Memorial Park. Contributions in memory of Elmer may be made to Good News Baptist Church. Our thoughts and prayers are with my Aunt Lois and cousins, Dana, Marty, Linda, Cherie and Leslie. I hope you carry the strength needed to get you thru these times of loss. God has blessed you with a lifetime of a great wonderful man, father and husband. I have a lot of fond memories of my Uncle Elmer. He was a quiet guiding light in my life, especially my youth. He lent me his ear and shoulder when I lost my own father and again when I returned home for the service. Thank you for sharing your life with me Uncle Elmer. You will be forever missed. Marty and Dana I am sorry for your loss. I enjoyed playing softball and visiting with your dad for years. Growing up on Oakdale St. you guys were the cool neighbors with the ice rink in the backyard. Thanks for the great memories.